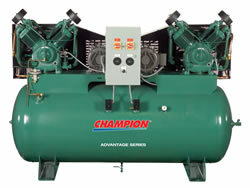 SKU: 90140 Categories: Air Compressors, Portable - Gas, Diesel, Electric Brands: Champion. Champion dependability when and where you need to take it, no electrical service required. Available in tank mounted gas driven or base mounted diesel driven configurations. Two stage, single acting compressor pumps carry a five year defects warranty. Available in 8 to 23 horsepower ranges, 30,60,80 gallon horizontal tanks or base mounts. 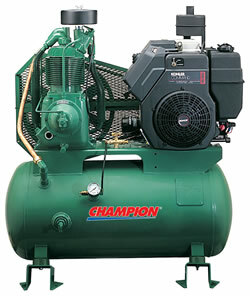 Honda, Briggs and Stratton, Kohler and Yanmar gas engines available.